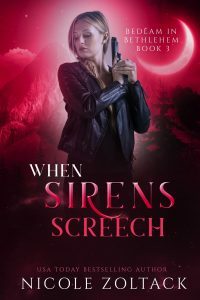 Vampires, werewolves, and now… sirens? Detective Clarissa Tempest has faced against all kinds of foes. She’s made some questionable choices. Now, she’ll have to deal with the fallout that includes her being cut from the police force. That doesn’t mean Clarissa is gonna turn her back on the people of Bethlehem. No how. No way. And it’s a good thing too because a new kind of foe has emerged. A siren who does not sing sweet songs. Even worse, vamps and werewolves are at each other’s throats. Literally. If Clarissa’s lucky, she’ll get through this too. If not, it’ll be worse than losing her job.